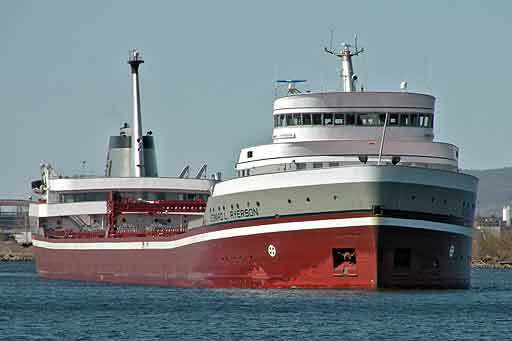 Above, the Edward L. Ryerson departed Duluth late morning with iron ore pellets. 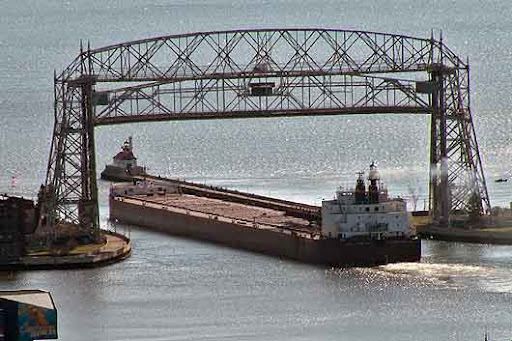 Below, earlier in the morning, the James R. Barker eased under the Lift Bridge on her way to Marquette, Michigan with a cargo of coal for WE-Energies. She has about 58,000 tons with her. Watching from Oklahoma City; I have always enjoyed your site. Originally from Highald Park IL on Lake Michigan and saw boats as a child…thank you for your work. I guess you are through all your health challanges? Homeland Security has put a crimp in boatwatching althogh the Canal is one of the best places in the Great Lakes to watch boats. Going to the end of the Interstate Bridge at the end of Reiss’s (sic) Point is a great place. great job been checking everyday my 2 boys ages 3 and 5 enjoy looking at the ships and they really enjoy the videos of the ships arriving and departing. Thank you for doing this. We live south of the twin cities and can’t make a trip to duluth this year so we will watch from home thanks to you. Keep up the good work on the site. I just moved into the area a few months ago from the south shore of Lake Erie and always had an interest in these ships, but never had the chance to see as many as I do here. Are there any other good places to observe/photograph them in Duluth/Superior other than the canal?